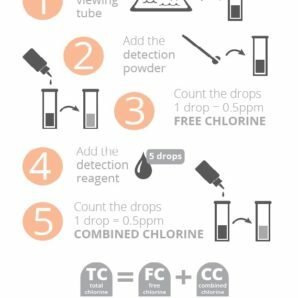 The different ways to test for chlorine in your pool – which one is best? Knowing which chlorine kit to use comes down to understanding what it is you are testing for, and why. Although the variety of test kits on the market can seem overwhelming, it’s actually not too difficult to get a test that suits your needs. What are you testing for? Probably the most confusing thing about chlorine tests is that they are not always testing for the same thing. Chlorine in your pool comes in a number of different forms (chlorine gas, hypochlorite, chloramines, hypochlorous acid, etc. ), and different tests capture these different forms with more or less precision. Free Chlorine. This is by far and away the most important fraction of chlorine to measure. Free chlorine is the amount of chlorine available to kill microbes including algae and bacteria, but also the amount needed to deal with human hair, body oils, and urine. If you maintain sufficient free chlorine in your pool, you don’t need to worry about leaves dropping or pets swimming. It’s fair to say that the vast majority of problems that people have with their pools is down to not enough free chlorine. Combined Chlorine. This is what happens when chlorine attacks something that shouldn’t be in the pool (like urine or algae). Once free chlorine combines and neutralizes these things, it becomes combined chlorine (chloramines), and is unavailable to bind to anything else. Measuring combined chlorine allows you to get an early indication of an algae bloom, or to confirm that algae is no longer present after treating your pool. Fun fact: it’s combined chlorine that gives off that characteristic “chlorine smell”, not free chlorine. 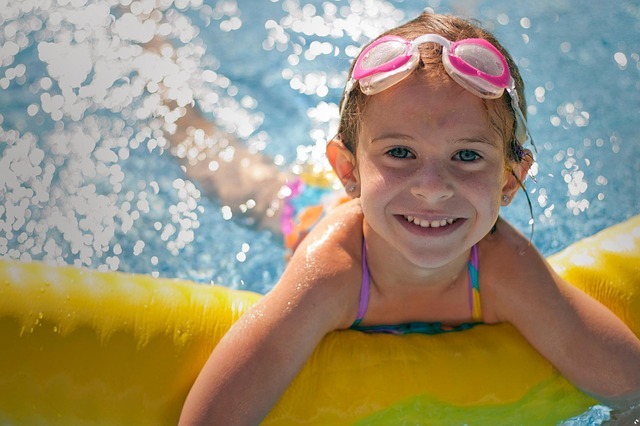 A pool with a “chlorine smell” usually has too little chlorine, not too much. Total Chlorine. If you are testing for total chlorine, then you are agnostic about the form of chlorine in your water. It could be mostly free chlorine, or mostly combined chlorine, and you will not be able to tell the difference. 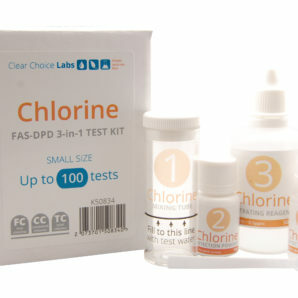 Most of the cheap test kits on the market measure total chlorine. Although this can be a very cost effective way to keep an eye on your pool, it will not necessarily give you the level of accuracy that you need to keep your pool healthy. For example, if you are testing total chlorine levels but your pool has no available free chlorine, the test won’t tell you that. This means your pool can’t easily be kept clean and safe. What type of tests are available? Most people have a chlorine test or two lying around, but few can actually identify what kind of test kit they have. Fortunately, the different types are actually pretty easy to tell apart. Test strips. We include these not because they are difficult to identify, but because many people don’t know about their limitations. While they are often thought to be the most simple test possible, their short expiry dates and their failure to work at moderately high chlorine levels causes ample confusion amongst users. They are also typically one of the more expensive tests on the market. OTO tests. If you have a dropper bottle based test where the water turns yellow in the presence of chlorine, then you have an OTO (orthotolidine) test. Primary advantages are cost and ease of use. If your pool is in great condition, but you are adding chlorine every day, this might be the best test for you. The major disadvantage is that it ONLY measures total chlorine. 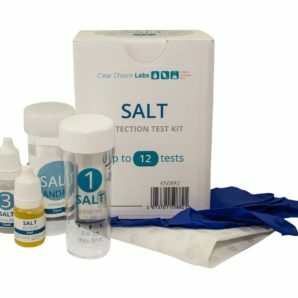 You cannot identify free chlorine or combined chlorine from this test. The accuracy is relatively poor with this test because it requires you to identify subtle colour changes. DPD tests. If you have a liquid, powder, or tablet that turns the sample pink in the presence of chlorine, and you then compare your colour to some standards, then you have a DPD (diethyl-p-phenylenediamine) test. 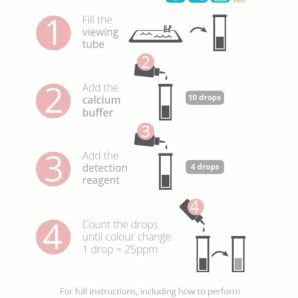 Different DPD tablets measure different fractions, but tablets are available to measure both free and combined chlorine separately, providing a huge advantage over OTO tests. However the amount of chlorine detectable is typically limited to less than 10ppm, and it provide false negative readings when the chlorine is too high. Like OTO tests, people who have trouble with determining subtle changes in colour may have problems with accuracy when using this test. FAS-DPD tests. The FAS-DPD test is probably the most flexible of all the testing methods. Like the DPD test, this test uses a liquid, powder, or tablet to turn the sample pink in the presence of chlorine. Where this test differs is the use of liquid drops (FAS, ferrous ammonium sulfate) to accurately determine the level of chlorine. Drops are added one at a time until the sample turns from pink to clear. The number of drops is proportional to the amount of free chlorine. Combined chlorine can be measured in a similar way. Although this test takes longer to perform than the DPD tests, the accuracy with which you can determine free chlorine is unmatched. Additionally, there’s a much higher upper limit to the chlorine levels that you can test (>20ppm if you are prepared to put in more DPD powder) – something critical if your pool is under attack from algae and you need to shock it. This combined flexibility and accuracy make FAS-DPD the chemistry of choice – which is why we stock this kit in our store. If you’re interested in highly accurate FAS-DPD kits with clear instructions and the backing of a team of scientists behind you, then why not check out some of the links below? This entry was posted in Love Your Pool and tagged chlorine, DPD, FAS-DPD, OTO, test strips, testing. Why is my pool cloudy, and how can I fix it? At last, an FAS-DPD test readily available in Australia and at a reasonable price. I’ve wanted this for years but refused to pay the rip-off prices for imported kits from the States. Now I’ll be able to shock my pool and know exactly what I’m doing; no more too much shock or too little – wasting time and money. 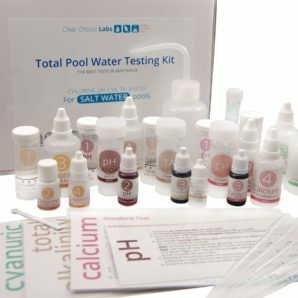 I was so pleased that I bought the complete pool water test kit! Thanks a lot guys!